Last week, we reported that Disney and LucasFilm will debut the full-length Star Wars: The Force Awakens documentary Secrets of the Force Awakens: A Cinematic Journey at the SXSW Film Festival today. This documentary will be part of the bonus features on the upcoming Digital HD and Blu-ray Combo Pack release of Star Wars: The Force Awakens, and in case you weren't able to see the documentary in Austin, we have a sneak peek from Good Morning America, along with a new trailer. 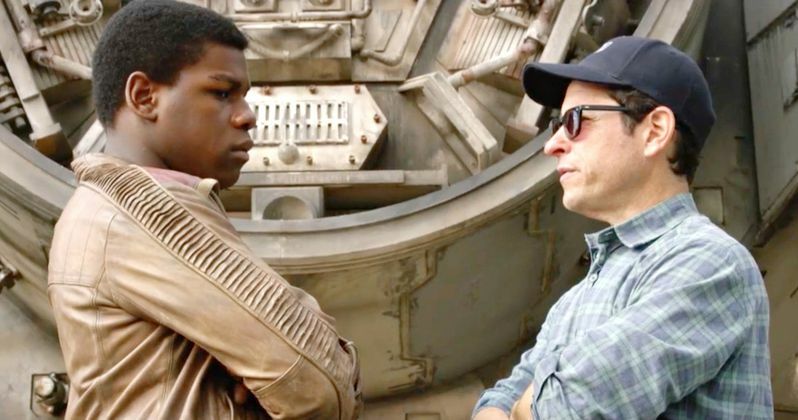 The sneak peek includes plenty of behind-the-scenes footage, along with excerpts from John Boyega's actual audition tape. We also see footage from the now-iconic final shot, where Luke Skywalker (Mark Hamill) meets Rey (Daisy Ridley) on his island sanctuary, with Mark Hamill revealing that "this feeling" came over him for the first time since he was on the Tunisia set for the original classic, Star Wars: Episode IV - A New Hope. We also hear from Gwendoline Christie (Captain Phasma), and Adam Driver exclaims that it was such a hassle to put on his Kylo Ren costume, it helped him get into character. This preview also explores the famous scene where Kylo Ren kills his father, Han Solo (Harrison Ford). Adam Driver revealed that this particular scene "terrified" him, while Harrison Ford stated that the scene "resolved" his destiny in a "powerful and effective way." In addition to this sneak peek, we also have a full trailer for Secrets of the Force Awakens: A Cinematic Journey, along with photos from the SXSW premiere, featuring J.J. Abrams and R2-D2, along with several of the Star Wars: The Force Awakens visual effects artists. Star Wars: The Force Awakens shattered box office records upon its debut to become the cinematic event of a generation with over $926 million domestic and $2 billion worldwide. The epic movie will be available to own early on Digital HD and Disney Movies Anywhere on April 1, and is available on iTunes and other digital providers for pre-order now. Fans can also explore all things Star Wars at iTunes.com/Starwars. This blockbuster comes home on Blu-ray Combo Pack and DVD on April 5. Lucasfilm and visionary director J.J. Abrams join forces to take you back again to a galaxy far, far away as Star Wars returns with Star Wars: The Force Awakens. The film stars Harrison Ford, Mark Hamill, Carrie Fisher, Adam Driver, Daisy Ridley, John Boyega, Oscar Isaac, Lupita Nyong'o, Andy Serkis, Domhnall Gleeson, Anthony Daniels, Peter Mayhew and Max Von Sydow. Kathleen Kennedy, J.J. Abrams and Bryan Burk are producing with Tommy Harper and Jason McGatlin serving as executive producers. The screenplay is written by Lawrence Kasdan & J.J. Abrams and Michael Arndt. Take a look at the sneak peek and trailer for Secrets of the Force Awakens: A Cinematic Journey, which will be available on the Star Wars: The Force Awakens Blu-ray and DVD sets. Can Infinity War Break Force Awakens Opening Weekend Record?